Multiple sclerosis (MS) is a notoriously difficult disease to treat, in part because the disease attacks nerve cells, destroying them. The end result is that a progressive paralysis sets in. People with MS have trouble with their vision and balance. Eventually, the brain is affected and it may become difficult to think and process information in a logical way. Treatments for MS try to slow the progression of the disease, but even then, most medications aren’t very effective. Researchers are constantly on the lookout for treatments that are not only successful in staving off the worst of MS symptoms, but that might actually halt the disease and turn the clock back on nerve damage. As is often the case, sometimes a medical breakthrough happens where you least expect it. Just recently—almost on a whim really—a team of researchers decided to see what effect near-infrared (NIR) light therapy would have on MS. The researchers were from the University of Wisconsin-Milwaukee and were specialists in studying the role of the immune system’s response in MS. They conducted an animal study in which rats with MS-like symptoms were given NIR light therapy for a week. The researchers were not expecting positive results from the study so they were very surprised when the rats’ symptoms began to significantly improve. In fact, another colleague had already made an equally impressive discovery about near infrared light. Rats who were suffering from blindness due to poisoning were able to recover their sight after undergoing the light therapy. The researchers had thought that the rats’ blindness was permanent, but somehow, near infrared light restored vision. Light therapy has been used in the past, but in a different capacity: to help heal wounds. At specific wavelengths, blue light can help to fight and treat infections. In fact, light is so good at this task, it can even take down MSRA—an antibiotic superbug that is causing a great deal of concern in the medical community. Blue light and near infrared light are both seemingly gifted at repairing tissue. Both act on an enzyme found in the mitochondria—the cell’s energy hub. The enzyme is called cytochrome C oxidase and when it is stimulated, the process of cell repair kicks into action. What researchers are trying to do now is to figure out which wavelengths of light are best for treating MS symptoms, at what dose and for how long. They compare the need for these variables to be established in much the same way that a drug treatment comes with a specific protocol and dose. It’s a challenging job to determine the right wavelength of light, but the researchers will keep at it. They have found, for instance, that 670 and 830 nanometer light triggers positive changes while 730 nm shows no beneficial effect. 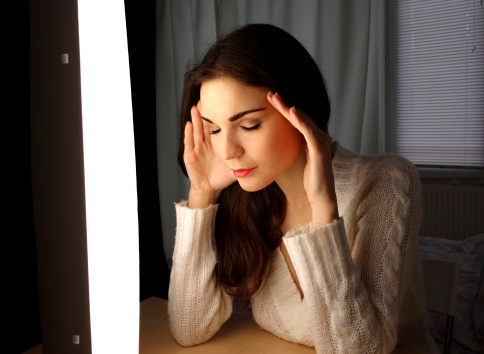 In time, phototherapy may be used to treat other degenerative diseases. By restoring damaged cells in the mitochondria, the body is protected from free radical damage. It is damaged mitochondria that cause a sharp rise in free radicals. These free radicals can then circulate through the body and trigger symptoms of aging and disease. “Light as Medicine,” Science Daily web site, Oct. 22, 2013; http://www.sciencedaily.com/releases/2013/10/131022102227.htm, last accessed Oct. 24, 2013. Knippenberg, S., et al., “Higher levels of reported sun exposure, and not vitamin D status, are associated with less depressive symptoms and fatigue in multiple sclerosis,” Acta Neurol Scand. June 13, 2013.